Staff of Sparks is a legendary Intelligence item card. It is part of the Core Set. The card is labeled as the monthly card for July 2016. However, this pre-dates the Monthly Card system; Staff of Sparks was added during closed beta and given to players for testing purposes (like many other cards) in that month. As such, the card is part of the Core Set and can be obtained through normal methods. 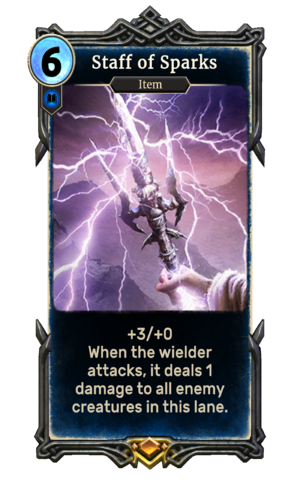 The card is named for Staves of Sparks, generic magic items that appeared in Skyrim. This page was last modified on 17 October 2018, at 19:29.